Speakers have been confirmed for our Spring Workshop! 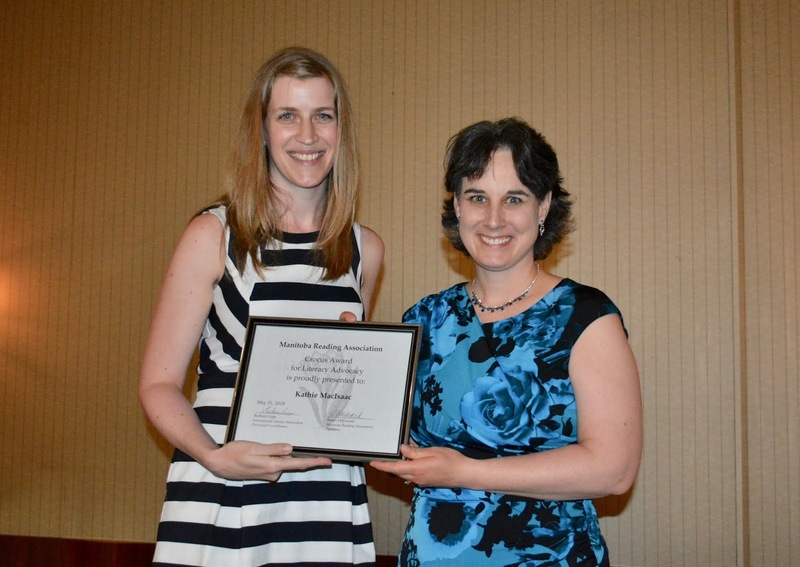 Pembina Escarpment Reading Council shared funds with six literacy projects in our region. Deanne Kuehn received $500 to add to her indigenous collection at the Treherne Elmentary School library. Carl Klassen received $300 to support Minnewasta School's Young Authors' Night. Gisele Rondeau received $300 for Western School Division's French support. Elm Creek Stay & Play Centre received $250 for new literacy materials for their nursery school and daycare. Jackie deVries and Nicky Spencer, teachers at Elm Creek School, each received $200 for their classroom libraries. You can apply for this year's awards. Awards are open to literacy projects that are in the community or in schools. 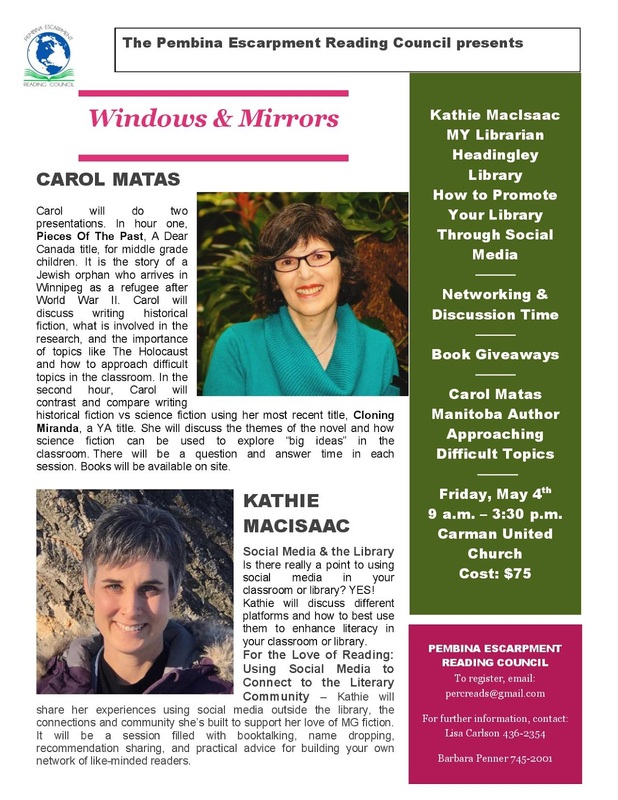 The Pembina Escarpment Reading Council (PERC) is supporting a new initiative to promote literacy in surrounding communities. This year we will be offering up to $500 to support successful designated proposals. The proposal may be for a school based or community idea including but not limited to summer reading programs, Little Free Libraries, Makerspace initiatives or other activities that promote reading, writing, listening and learning in our schools and communities. If your project is approved, we would love to see photos of your completed project and any other information you would like to share with us. The application form is available on our website or by email percreads@gmail.com. Barb Lepp presenting one of the first grants to Karly Vancott at Starbuck School. Your new Pembina Escarpment Reading Council executive met recently and set a date for a spring workshop. Plans are in place for early May and speakers are being contacted. Stay tuned for more info. May 9th is the tentative date, but we will confirm soon. 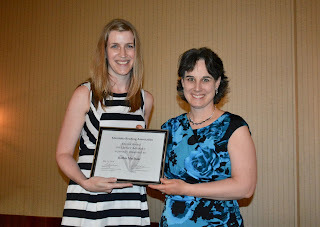 PERC President Barbara Penner presents Kathie MacIsaac with her Crocus Award for Literacy Advocacy at the Awards event in May. 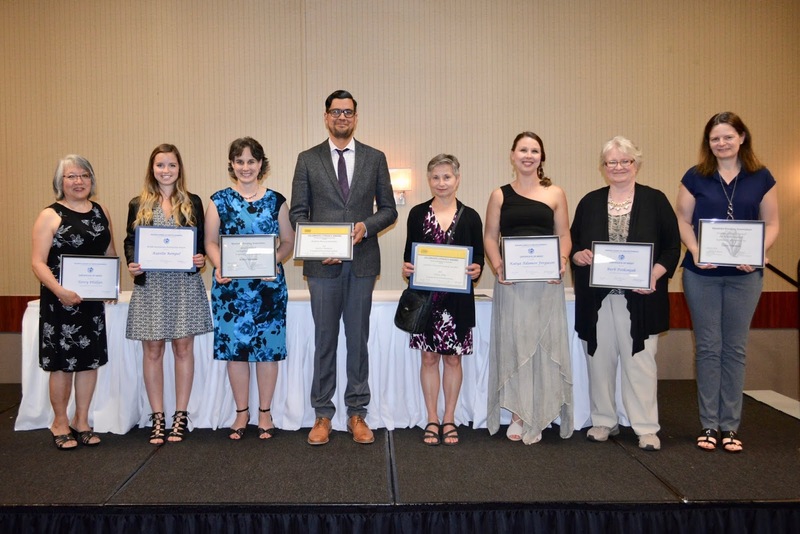 Many PERC connections received awards at the joint event in May. 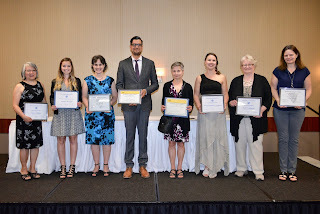 Far right - Principal Tanis Thiessen received a Crocus Award for Administrators. Kathie MacIsaac received the Crocus Award for Advocacy (see above). Registration is open for our Spring Workshop. Include your name, school or library, and telephone number. Pay by cheque or purchase order. Making Writer's Workshop Come Alive! Syd Korsunsky is returning to the Pembina Valley. Contact a PERC representative for more info. I received a galley of this book from NetGalley. The hardcover edition is to be released on October 24, 2017. Jason Reynolds's prose. Who can deliver free verse with such meaning? I love the cover of this book. Although I read it as an ebook from NetGalley I love the look of the black and white cover displaying old-style round elevator buttons against a scratched and soiled wall. I love the pages that appear to be the scuffed paint of the elevator walls. I love the sparsity of words on the page. I love the chapters told as a trip in the elevator. Who can turn your thinking around in 200 pages the way Jason Reynolds can? Will's brother Shawn was murdered and Will believes he must avenge the death. 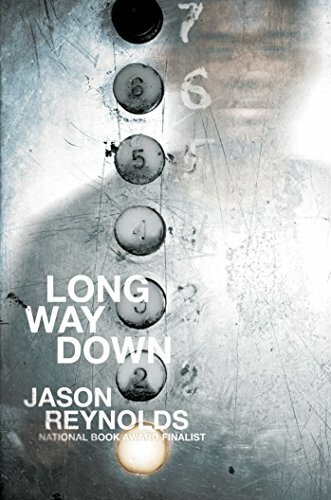 Like all of Jason Reynolds' novels, the characters are wonderful and the story is never simple. The novel is longlisted for the National Book Award for Young People's Literature. I will buy this book so I can read it again in hard copy. We had another successful workshop in April. We appreciate the feedback from our participants and it helps determine our agenda for the next workshop. Here is what the exit slips revealed. Do you have any ideas for topics or presenters for future PERC workshops? · How can schools / school libraries and public libraries support each other? · Would love to hear Sally Bender speak again! · Publisher? How does a book get published? · Other resources available to us – MB Ed. Lib. was great! · Makerspace lady was very informative as well! · Very good day – thank you! · Thanks so much for all your work in planning today’s session. It has been packed with great content! Thanks! · Only consideration might be to have session at a location that has wifi access for devices other than cell phones so we can check into resource online in networking time.